Our last day of cycling is upon us and we are heading back into Hanoi. One thing we have not explained is that each of the viliages we visit specialises in some sort of farming or production. For example the villiage we stayed at on our first night specialised in weaving, others in rice wine, corn, sugar cane, etc. 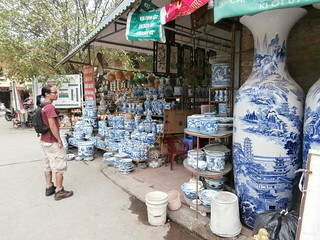 Today the village we stopped in on specialised in ceramics, or pottery. Shop after shop of vases, tea sets, dinner sets, statuettes and more. The handpainting is so delicate, but quick. In a matter of minutes these women had painted two or three cups and with such precision. The ceramic market was also an experience, whilst much of it was very similar, there were some very interestng uniques pieces and had I been allowed another suitcase I would have easily filled it! On a quick food related side note, we tried Bun cha today. BBQ pork served in a broth with rice noodles. The secret to this dish is the broth, which Hoang tells us is quite tricky to produce, balancing the flavours of the various ingredients. What was in it, I could not say, but it was sweet with a bit of tang at the same time and delicious. Hoang also treated us to another sticky rice snack from a road side shop. This time it was wrapped in a leaf and the rice was so gelatinous that the grains had completely dissolved into one another. It had a filling, which tasted like it had garlic, but I couldn’t say what it was. Not bad, and it comes neatly packaged so that is handy for when you are trawling through the markets. Once we arrived in Hanoi, Hoang took us to a water puppet show. Traditionally performed in flooded rice paddies, the puppetteers are hidden by bamboo screens and manipulate the puppets on poles submerged under water. The story covered various aspects of vietnamese culture and explained some of the traditional dances and important legends. We did not take any photos (it was pretty dark inside and we didn’t bother purchasing the tickets required to be allowed to take photos), but here is a youtube clip as an example. Good to hear I’m needed. I do have to ask for a few more days leave in December so I have noted that you are happy for me to take some. Thanks Rod!